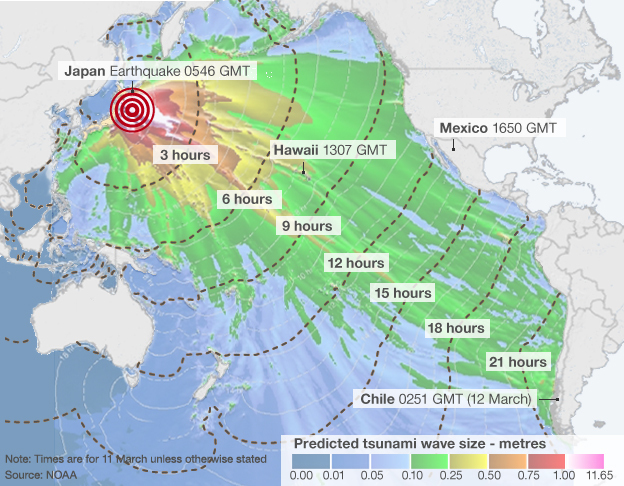 An 8.9-magnitude earthquake off the coast of Japan caused fatalities, injuries and damage, then it triggered a ten-meter-high tsunami higher than many islands in the area when I walked into work this morning. As we watch the images from live Japanese television, I can only think that Japan is one of the countries where you’ll have the best chance to survive earth quakes and natural disasters. If anyone can pull through it, it’s the Japanese! A maelstrom outside Japan. This is not the boat reported on. So far it seems a lot of the countries in the Pacific have gotten off scott free, as the waves are scaling down with a maximum of 2m height in Hawaii (see wave map). You can watch the BBC Live coverage here. Hang in there and hang onto something! You’re on our minds! You can never be ready for that kind of tsunamis. You can prepare and prepare but that doesn’t mean that you will master or control mother nature. But I think it’s obvious the disaster training has saved quite a few Japanese lives these last four days! Previous Previous post: Unpacking the SheevaPlug "plug computer"